I collected 96 plastic straws, 56 bottle caps, 1 spoon, 1 cup, and a random assortment of other broken plastic bits. Unfortunately, there was so much more that I physically couldn't pick up because I only had a small bag with me. I desperately needed a bigger bag, and will be bringing one next time - that's for sure! It didn't feel great picking up some trash and leaving other larger things behind, but I also know that it was definitely too big of a task for just me to accomplish on my own... as much as I wanted to be the super hero and leave the beach completely 100% spotless. Sometimes I wonder what goes through people's minds as they walk past trash on the beach. Are they just numb to the fact that it's there and is a problem? Has litter just become normalized? I mean I sure have walked past litter on the beach and elsewhere (guilty) many times before (we all have) - but at the end of the day... is choosing to leave it there really better than putting it there in the first place? I think a lot of people take on the attitude: "It's not my trash to pick up" because they didn't put it there... but that solves nothing. Sure it's gross, and maybe people just don't want to get their hands dirty... (but you can wash your hands after or bring gloves!) At the end of the day - we only get one earth to call home... and I think we all have to take ownership of this mess we've collectively made. Ignoring it isn't an option. Plastic straws have definitely been stealing the spotlight lately with many big companies banning their use of them - but there are SO many other things destroying our oceans too. This infographic was super informative and helpful in seeing where plastic straws fall on the spectrum and what other things are wrecking the most marine havoc. As much as I love to frequent the beach, I know that I don't go into clean up mode often enough. From here on out, I'm hoping to make it a more regular part of my beach trips. I'm challenging you to do the same! Whether it's the beach, a park, or just around your neighborhood - I guarantee picking up that piece of trash will feel a whole lot better than making the conscious choice to leave it there. Team up with friends or family members. Because two, or three, or more sets of hands is always better than one. The more sets of hands on deck, the more you can pick up! Make a game out of it. 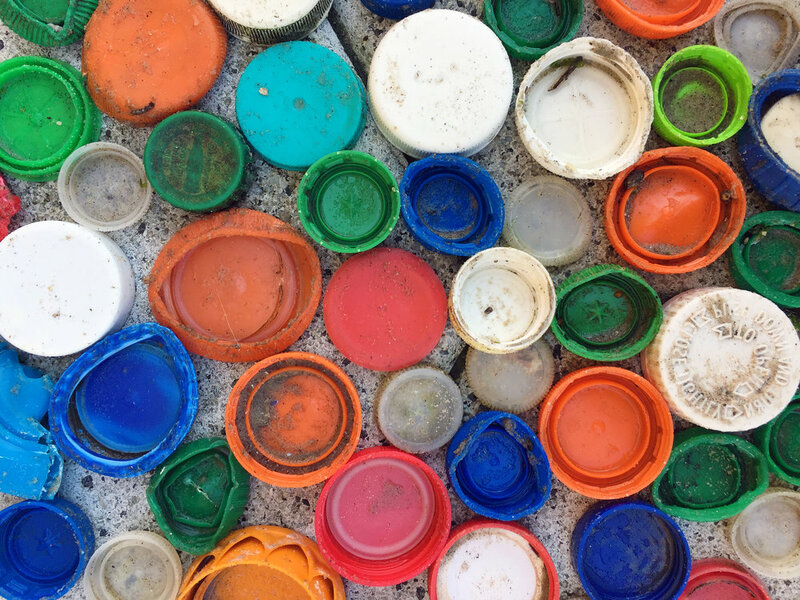 With others or with yourself - who can collect the most of any particular item (straws, caps, bottles, cups, bags, etc)? Can you collect more than the last time you did a clean up? It could maybe even be fun to keep a running count for the month, summer, year, or lifetime (this one's for you, spreadsheet lovers! haha). Join a community clean up event in your area. (Or organize one for your community!) I've never done a community clean up event, but I definitely want to look into doing one soon or even organizing one of my own in the future. I imagine it being such a rewarding experience meeting new people and being surrounded by others who want to do good for the planet. Turn it into art! One man's trash, another man's treasure - as they say. ;) I didn't keep or transform what I found.. but there are some people who do amazing things like turning beach plastics into collages, illustrations, or sculpture. This post is not sponsored by Strawless Ocean - or any organization for that matter. It's just a cause that I feel passionate about and felt compelled to write something more beyond a concise Instagram post - and so, here I am! Lately, I have been struggling to find the enthusiasm to create and share my voice on social media and this online space - but yesterday I felt like I was tapping into that special energy that I haven't really felt in some time again. I have a lot more to say about the topic of "influence" (cue the cringe) and using your online platform in a way that actually matters - but I will save that longer discussion for another day, haha! Ultimately, I felt like this topic was one that mattered and was worth talking about.